Halbai or Halubai is a sweet dish from Karnataka which is literally known as rice halwa or rice cake as this dish is usually prepared with rice, jaggery and coconut with ghee. 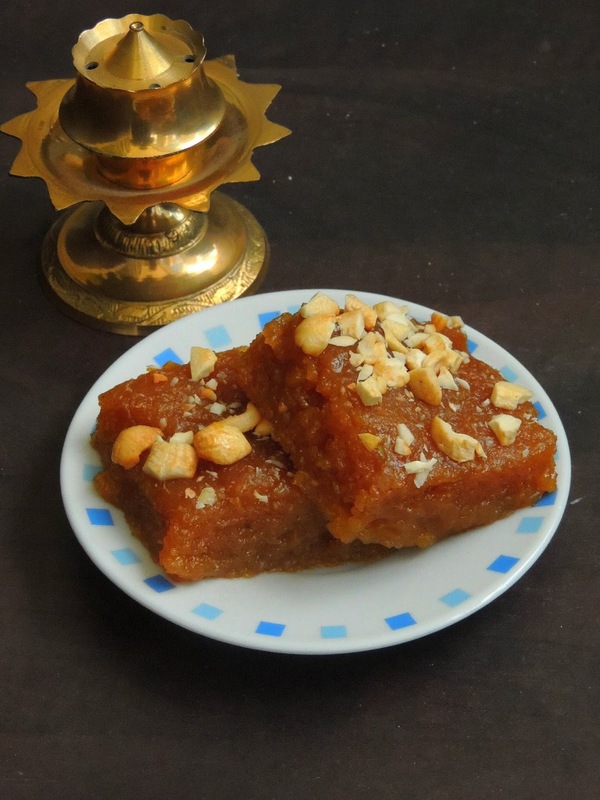 This sweet is prepared during Nagara panchami festival and its quite a healthy sweet to indulge without any fuss. Halbai is often made in Udupi, Mangalore and Malnad region of Karnataka for a festival or celebration. Halbai is quite a delicious sweet which ressembles quite like burfi which is dangerously addictive. Though Halbai is traditionally made with rice, even rice flour, ragi and semolina can be used to give an another variation to this ultimate sweet. Since fresh coconut and jaggery is used in this sweet, trust me you cant just stop with a slice of this ultimate sweet. As i told earlier, traditionally this dish is prepared with a grounded rice-coconut paste and jaggery syrup, once cooked until they turns thick, this sweet is poured on a grease plate. Later, slice the halbai and serve. But my today's post is completely prepared with chiroti rava, yes its quite an easy and tasty version of halbai. You might have noticed that am running this week's blogging marathon with No Cook Desserts as theme. A breakfast parfait dish is quite easy to dish out to please some hungry tummies easily with some wholegrains flakes and fruits. 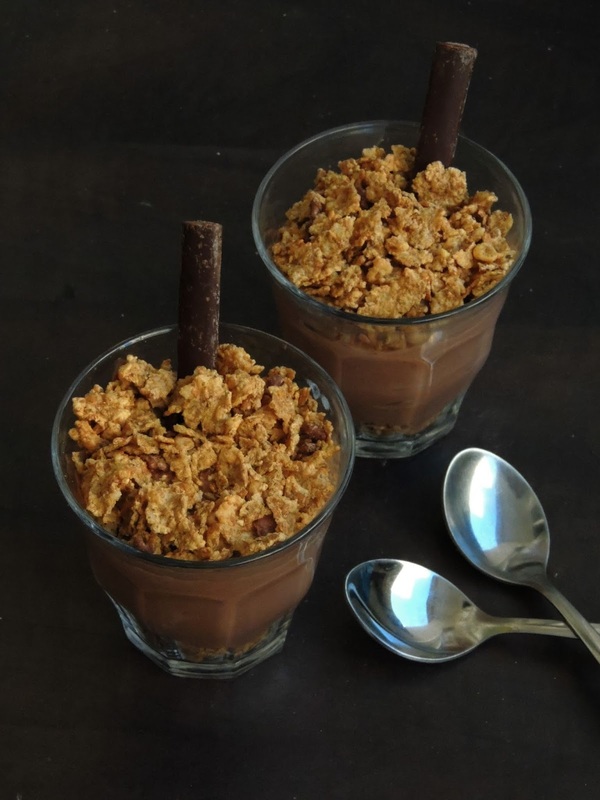 However easy parfait desserts do exists which can be dish out with less efforts as well. Parfait is a type of dessert which have its origin in France. Parfait is made by boiling cream,egg,sugar and syrup to form custard like puree which is not served in glass as its a frozen dessert. But the American version includes some cereals, fruits, nuts, yogurt to make a dessert served in a tall glass.Coming to my today's post, this dessert calls for mascarpone cheese which works awesome to make no cook style of desserts, i have already tried couple of parfaits with this fabulous cream cheese. Chia seeds are tiny black seeds which ressembles like the basil seeds. When soaked in a liquid, chia seeds double their volume, and these seeds comes from the plant Salvia Hispanica which is related to mint. 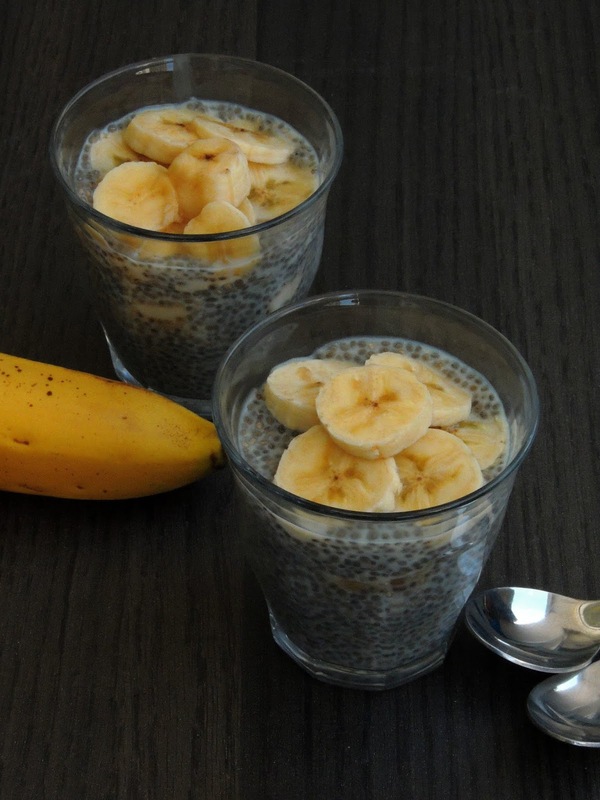 These chia seeds were an important food for Aztecs and Mayans since a long. Chia seeds give a super massive amount of nutrients with very few calories. These seeds are excellent in fiber. Small amout of chia seeds supplies only 137 calories.Not to forget that chia seeds are loaded with Antioxidants which protect the delicate fats in the seeds and have various benefits for health. Do you know Chia seeds are loaded with proteins and its contains the most weight loss friendly dietary nutrient. Obviously the high fiber and protein content in chia seeds help a lot to lose weight. Looking for an easy, eggless and a delightful luscious dessert for your sunny days. 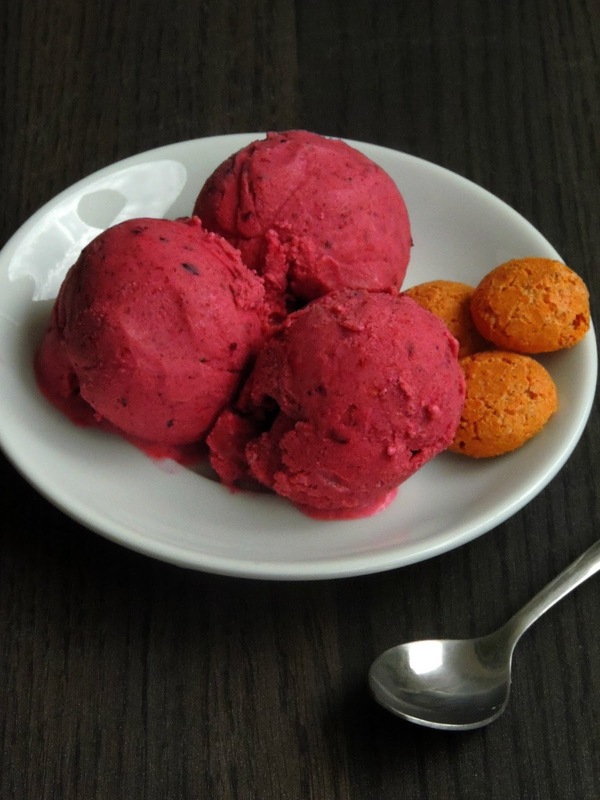 Dont forget to check my today's post, No churn frozen mixed berries icecream is quite a quick icecream to prepare with less efforts. This icecream doesnt need any special gadgets apart from our mixie or else a hand blender. Here in Paris, we get easily frozen berries in every stores as they are available for making desserts and sauces with. Obviously my freezer will always have this berries as they are handy to prepare some fabulous chilled drinks as they are very easy to prepare with. Blend these frozen berries with some cold milk,sweeten it with your favourite sweetner and they are just ready to relish. Coming to my today's No churn frozen mixed berries icecream, you just need heavy cream, sweetened condensed milk and frozen berries. Yes this icecream needs just 3ingredients, how wonderful na. Uthappam/Oothappam is a thick pancake which is usually prepared with leftover dosa batter, uthappams are almost like dosa but with toppings. Its one of the known South Indian dish after idlies and dosas. Uthappam is traditionally made with toppings such as tomatoes, onions,chillies,capsicum and coriander leaves and however other ingredients like chopped mixed vegetables, coconut are also used for making this dish. Often served with sambar or coconut chutney, uthappam can be prepared with different variations. 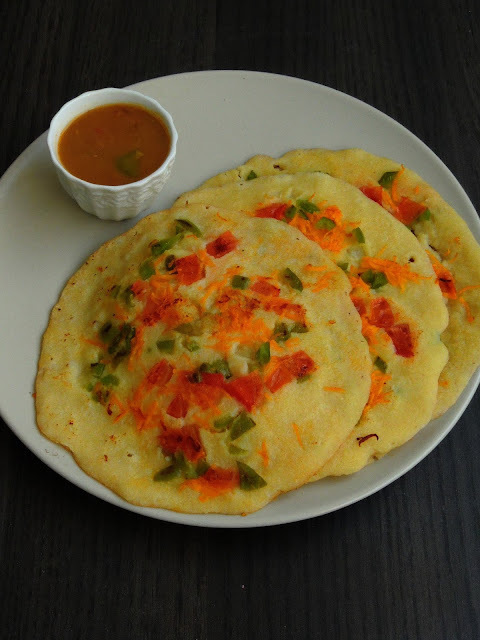 Nowadays, many millets are used in making dosa batter,hence you can also dish out some millet based uthappams. However instant versions of uthappams do exists. And my today's recipe is one among those instant versions. One of the easiest dish which can be prepared easily with semolina/rava or else with cornmeal rava. One of the most favourite South Indian breakfast of mine is Semolina aka Rava Kichadi. I can have this dish everyday without any fuss. Prepared usually with mixed vegetables and roasted rava, this dish makes an incredible breakfast with some spicy coconut chutney. However when i planned to prepare semolina kichadi, i opted for quinoa instead of semolina. 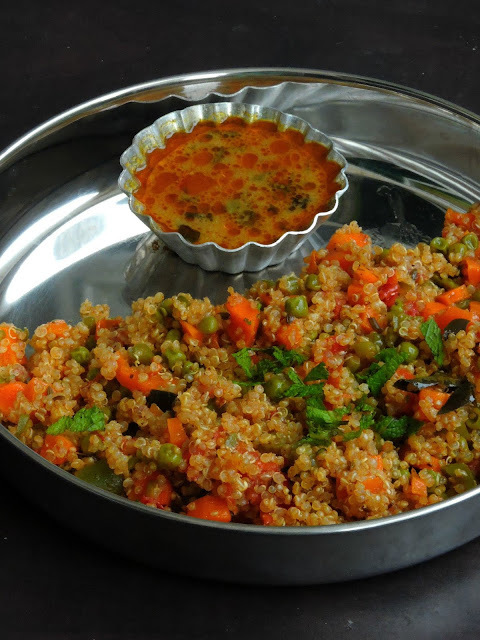 With lovely medley of vegetables and quinoa, trust me this kichadi tastes absolutely delicious. Usually ghee is used to bring a nice aroma to this dish, and i opted for oil as i want to prepare this kichadi as a vegan breakfast.An excellent,quick and easy breezy breakfast or dinner to enjoy without any hesitation.My mom used to make this khichadi with garlic cloves instead of ginger garlic paste and temper it with whole spices like clove,cinnamon stick,bayleaf and fennel seeds instead of usual tempering spices, this will give definitely a fabulous masala flavour to this simple fusion khichadi. 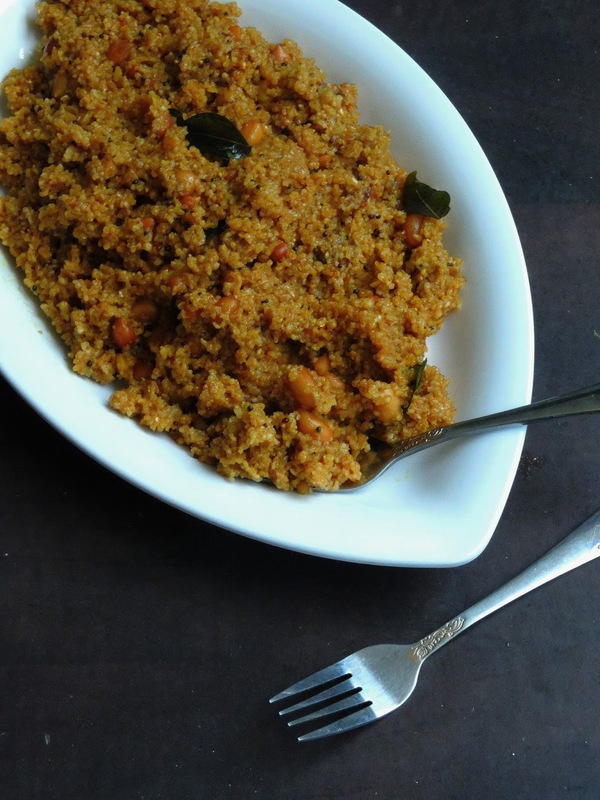 Puli upma aka tamarind upma is usually prepared with rice flour, coarsely grounded rice batter or else with rice rava. Its quite an interesting dish which makes a fabulous breakfast, snack food or else prefect for dinner. Almost like upma,this puli upma is flavoured with usual spices which we usually use for upma apart from cooking the grains with tamarind extract. Whoever loves to kick start their day with a dose of tanginess in their food will definitely enjoy this healthy version of puli upma. Since this dish is a delightful breakfast dish, you doesnt even need a side dish to enjoy with. To bring more nuttiness to this incredible healthy broken wheat upma with tamarind extract, i didnt forget to add some peanuts while tempering which is completely optional. Since i want to give a healthy twist to this traditional dish, i opted for broken wheat,however you can replace the broken wheat very much with rice. You might have noticed that am running this week's blogging marathon with Make them as Pizza as theme. After two interesting pizza, am finishing this week's theme with an another kid's friendly cone pizza. Trust me this pizza will definitely become everyone's favourite at home, if you make this cute looking pizza at home for a dinner or lunch. My kids went crazy when i served this pizza for dinner with some salads. Initially when i picked this week's theme aka Make them as Pizza, my mind went immediately for pizza with dosas, chappathis, rotis etc. But some leftover storebought tortillas pulled me to finish them as this cone pizza. This pizza is definitely a easiest one to prepare even for your get together. 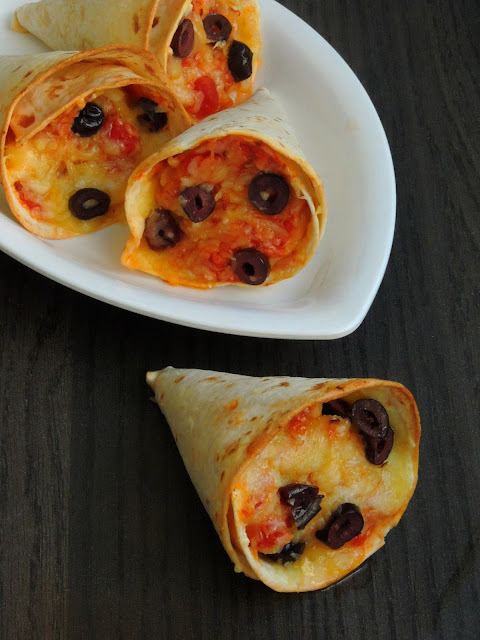 Mini sized cone pizza works awesome and definitely a prefect crowd pleaser as well. You can dish out two cone pizzas with a tortilla, obviously you can stuff this pizza with any of your favourite toppings. Whenever i make naans at home, i will definitely gather all the ingredients to dish out pizza with them. But somehow i have been postponding to post my home made naanizza in my space. Recently, after our Summer vacation, back home kids were missing our spicy foods. One week with non spicy Greek foods, our tastebuds started begging for some spicy Indian foods. Obviously for our dinner day before yesterday, i dished out some whole wheat naans with chicken curry. After having a tummy full satisfying meal, they were some leftover Naans which i freezed for later use. Yesterday after spending a half a day with my Schoolmate who came all the way to Paris from Chennai, i was completely exhausted. 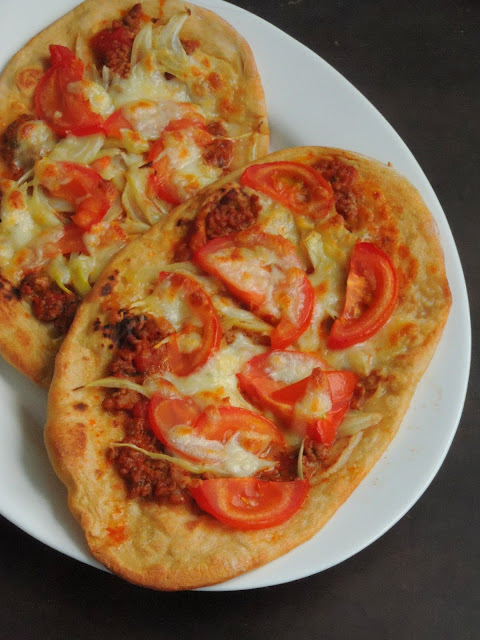 Felt super lazy to prepare our dinner, obviously those frozen Naan came to my rescue and turned them as some Naanizza which i simply topped with a soya kheema masala, some chopped onions, tomatoes and grated cheese. 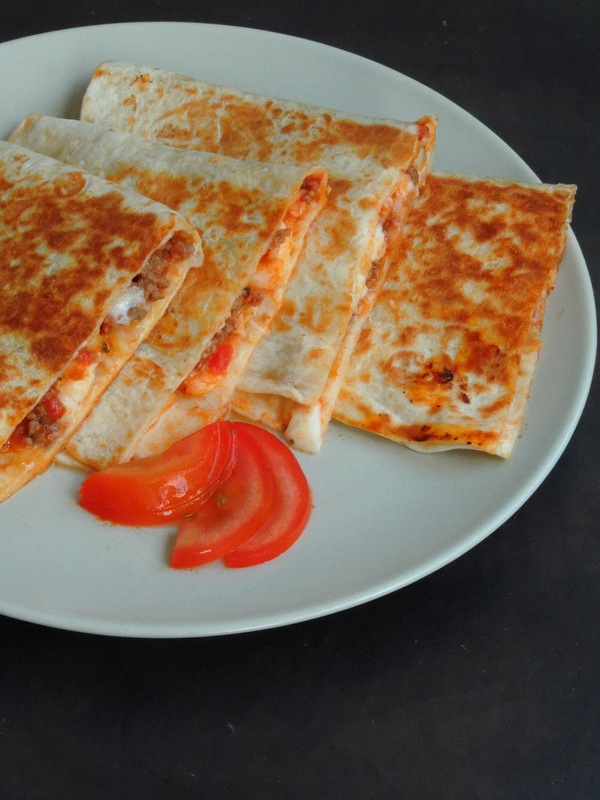 When Pizza and quesadillas meet together, obviously the final result will be Pizzadillas or Pizza Quesadillas. My kids are crazy fans of Pizzas, and nothing can beat the homemade pizzas na. However i plan myself to make pizza crust often at home with different grains in it, so that i can feed my kids easily pizza with healthy grains in it. And do you know that these homemade pizza crust base can be freezed easily which will be really handy to use whenever you feel like making a pizza party at home. Thaw the pizza crust and top them with your favourite toppings and your pizza is ready to bake. Trust me this works awesome for me. But in case if you dont have time to make your own dose of pizza crust, dont worry. Now you can dish out some delicious, cheesy, extremely addictive and dangerously tempting pizzas with some store bought tortillas. 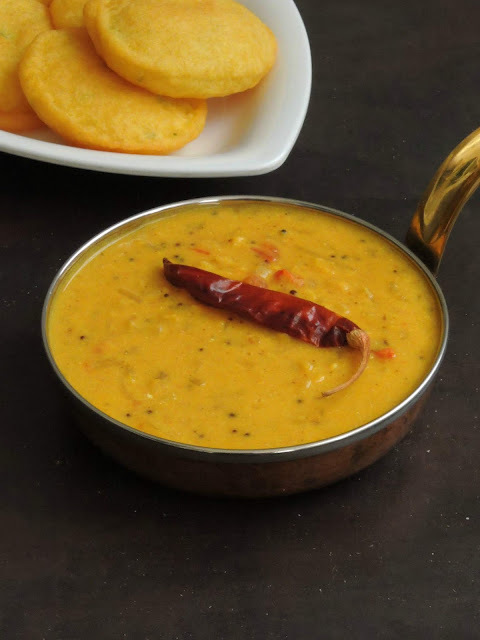 Nothing can beat a bowl of comforting dal with some rice or rotis to finish our meal. Am a ardent fan of simple dal recipes and whenever i get a prefect dal recipe to cook with, i wont skip making the dish. A prefect satisfying meal must have definitely a dal based dish to please our tastebuds rite. And my space is loaded with many delightful protein rich dal dishes. However i have many to try and show case in my space. My today's post is an interesting dal from Chattisghar cuisine. Actually this dal dish goes for a facebook group event in which i have been a member since three months. Every month either we cook with Alphabets or Recipe swap, and vice versa. Since i like challenges, i couldnt stop myself to join this group. This month's challenge is Recipe Swap and i have been paired with Seema of Mildly Indian. While going through her space, this creamy Channa dal khatta caught my attention and immediately i tried at home to pair with Dhuska. Trust me, this dal works awesome with Jharkhand fried bread and we finished our lunch happily with these two delicious Regional foods.